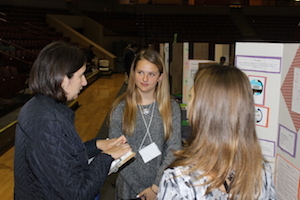 The 2018 Lowcountry Regional Science and Engineering Fair was held Tuesday, April 10, 2018 at the College of Charleston TD Arena. Over 100 students participated showing off their wonderful projects in science, engineering and math. Congratulations to all of our winners, this list of which can be accessed at http://lhsm.cofc.edu/lowcountry-science-fair/index.php. Student being judged at the Lowcountry Regional Science and Engineering Fair. The top winners this year included: From the Junior 1 Division (5th and 6th grade), Sam Owens, from Lowcountry Leadership Charter School, took 1st place for his project, What Does it Take for Clay to Break?, looking at the strength of various types of clay, including air dry, oven baked and epoxy- based clays. From the Junior 2 Division (7th and 8th grade), Ella Cheek, from The Georgetown School of Arts and Sciences, too 1st place for her project, Get Color Stoked, determining whether or not color evokes certain emotions in people. 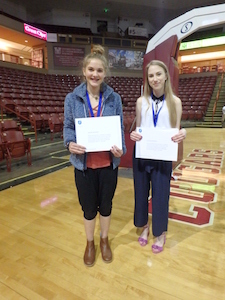 From the Senior 1 Division (9th and 10th grade), Naomi Higgins, from The Georgetown School of Arts and Sciences, took first place for her project, Test Tunes, an experiment to determine whether or not music or sounds are motivational and improve concentration. And from the Senior 2 Division (11th and 12th grades), Anna Smirnova from Academic Magnet High School, took first place for her project, The effect of fullerene additives on P3HT films processed in binary solution, to determine how CBM and various solution preparation methods affect the aggregation of P3HT. The overall winner of the Lowcountry Regional Science and Engineering Fair was Anna Smirnova, who will travel to Pittsburgh, PA to present her project at the Intel International Science and Engineering Fair. In addition, this year, the overall second place winner, Naomi Higgins, will also travel there. Amazing Projects!